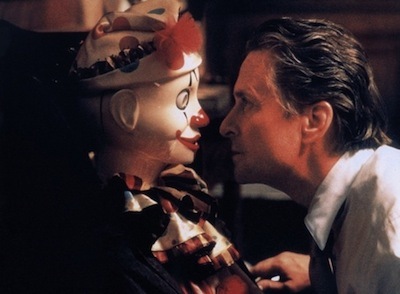 Michael Douglas, playing investment banker Nicholas Van Orton, asks the question midway through a rigorous test to determine whether he is suitable to participate in the elaborate scenario that is the singular plot point of David Fincher's 1997 movie The Game. It's a question he will ask again as the film wears on, one of many echoes and repeats that occur throughout the motion picture. More important than the question, however, is what is going on and how he asks it. Van Orton has been watching a series of filmed images with subliminal messages buried in them, a horrifying montage certainly meant to recall a similar B-roll shown to young Alex in Kubrick's A Clockwork Orange *. Fed up with the grotesquerie, the man stands and turns into the blinding light, bathed in the flickering images as they emanate from the projector, staring deep into the lens. It's as if he is asking the movie itself when it will stop. Or letting it absorb him. Because, for whatever else it is, The Game is a tribute to the art of cinema. It is a romp through motion picture technique, bringing the visceral experience that movies attempt to re-create to its protagonist, establishing its own meta reality, a wheel within a reel. Nicholas Van Orton will soon find himself in his own version of North by Northwest , part of an unstoppable action scenario, though this time by way of the convoluted grifts in con men movies. The staging of each incident would be impossible in real life. Or so we tell ourselves. Isn't the biggest con of a movie like The Grifters or The Sting or The Brothers Bloom [review] that we end up accepting that these schemes work? It's the promise of all good movies: for the two hours we sit in the dark, we are made to believe. Nicholas Van Orton is kind of your typical protagonist for this kind of story, the imaginary rich man bored with his routine and too disconnected to know it. Divorced, isolated, all work and no play. His brother Conrad (Sean Penn) is his predictable opposite, a "free spirit" whose life choices have had other consequences (drugs, legal trouble, etc.). It's Conrad who buys Nicholas a session with Consumer Recreational Services. This clandestine business, conducted behind smoked glass, provides specialized experiences for each of its clients. What Nicholas will soon be in for is an elaborate set-up, a running adrenaline-junkie dramatization of a wronged man scenario. Nicholas is barely in the game before he loses track of what is real and what isn't. Is he really playing a part in an out-sized fiction, or is he being scammed? Hospitals, cops, attack dogs, guns, car crashes, private eyes, pretty girls, keys with no locks, a mausoleum in Mexico--all of these puzzle pieces could either add up to the greatest thing that's ever happened to Nicholas, or it could just be a backdoor to ruining his reputation and siphoning off his money. The excess on display is its own gag. At one point, Nicholas loses a shoe and comments, "There goes $1,000." When the waitress, Christine (Deborah Kara Unger), clarifies that his footwear costs a cool grand, he quips, "That one did." 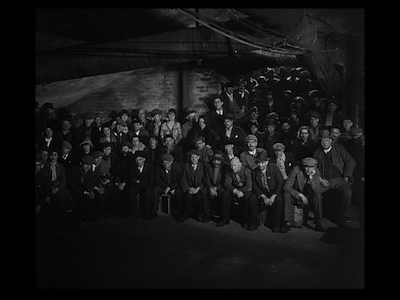 The economic divide between them--and really between Nicholas and everyone else--is one Fincher never lets us forget. His lifestyle is ridiculous, as is his endless pursuit of more. This is the underlying critique of The Game, and it won't be the last time Fincher puts the boot into greedy corporate stooges. (See also: the character assassination of Mark Zuckerberg in The Social Network [review]; the villainous bankers in The Girl with the Dragon Tattoo .) This skewering seems even more prescient now, or at least no less relevant, given the current ongoing, worldwide economic crises. Nicholas Van Orton is reckless with how he spends his money and lacks empathy when his actions cost others. The fact that the film's criticism of his behavior doesn't maintain its sharpness is perhaps why many find The Game unsatisfying. Nothing bad actually happens to Van Orton, and his sins are washed away right alongside his daddy issues in the movie's finale. The thing is, the moneyman's existential story arc is secondary to the plot. Van Orton learning to live in the moment and to be more self-sufficient (I'm surprised we don't actually get to see him change a tire by the time credits role) is merely the excuse that allows Fincher and screenwriters John Brancato and Michael Ferris to do all the other stuff. ** It's like one of the characters explains, "Discovering the object of the game is the object of the game." Any greater meaning is unnecessary. The whole idea here is to keep us guessing, keep us watching, and keep us asking what happens next. Which is what makes The Game such a rollicking success. 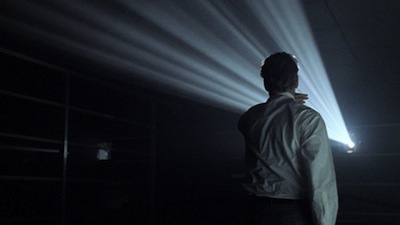 For as obvious as Fincher's technique can often be--and pause during literally any point in The Game and you can't help but admire how beautifully Harris Savides (Somewhere [review]; Margot at the Wedding [review]) shoots this thing--the magic trick here is the sleight of hand by which the expert filmmaking disappears. The music, the editing, the excellent performances from the movie's cast--all of these things blur together and fade into the background. Fincher doesn't give you time to ponder how it's all fitting together, you're too busy trying to keep up. He is the cinematic con man, and we are his marks, and the only way the ruse will work is if we don't ever question its veracity. Thus, it doesn't really matter if, in a way, there is no "there" there. The Game has shallow characters and a hollow center, but the pleasure that comes from watching the wheels spin round and round means that none of that matters. Hell, even the end, with a promise of canoodling at the airport, offers romance without any of the weighty details. 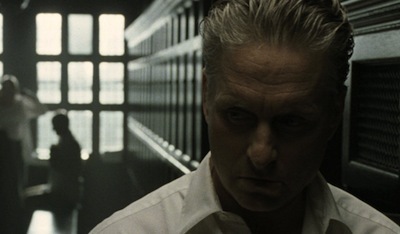 Fincher could have just as easily cut to Deborah Kara Unger and Michael Douglas rolling into an upper berth as their train passed through a tunnel. The Game is, indeed, that obvious--and also that entertaining. * The piano trills throughout the movie, provided by composer Howard Shore, kept making me think of another Kubrick film about deception, Eyes Wide Shut . Any actual reference point to that movie would be impossible, however, since it was still two years away when The Game was released. ** There apparently were many other writers who doctored the script, which isn't surprising. Brancato and Ferris, as a team, are responsible for quite a few stinkers, including De Palma's Femme Fatale , The Net , and Catwoman . These writers could use a helping hand or two. 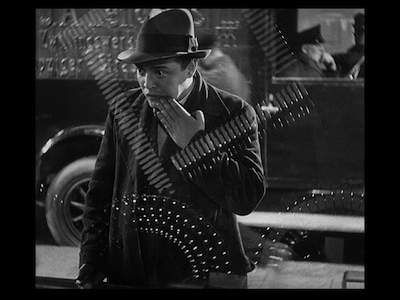 I don't know if Fritz Lang's M would be considered the first police "procedural" in cinema, but the 1931 motion picture is certainly very close to it. Having seen the film multiple times now--and this go-around actually seeing it in a theater for the first time, as I caught a screening of the new 2K digital restoration put together by the Munich Film Archive--M is one I've gotten to know fairly well but that still manages to surprise me each and every time I see it. Since first discovering M as a teenager, I usually focused on the almost surreal, Brechtian depiction of Germany's criminal underworld, culminating in the trial sequence where the crooks judge the murderer. Seeing it this time, I was struck by how methodical Lang and his wife and screenwriter, Thea von Harbou, are in arranging the different elements of the story, following the case step by step toward its conclusion. M opens on a city in distress. Someone is kidnapping and killing children. The situation has already passed into popular culture, as evinced by the little girls singing jump rope songs about the murderer. He is a bogeyman, one notch to the right of an urban legend. This specter of death is also, at that moment, on the prowl. 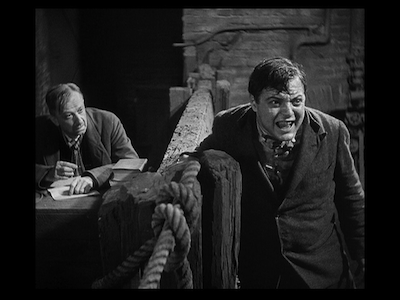 Peter Lorre stars as the disturbed killer, Han Beckert, delivering a performance that is chillingly calculated. Beckert is an icy personality with a chameleon's talent for fitting in. He is kind and warm to the little girls whom he bribes with candy and balloons, cocky when writing letters to newspapers about his actions, but cowardly when consequence comes knocking. 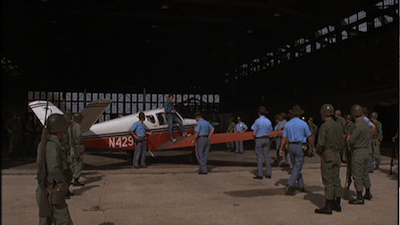 Early portions of the film follow the police as they chase down leads looking for the killer. We glimpse into private meetings, back room preparations, and the investigative labs, with Lang showing us how the detectives, experts, and technicians process the evidence and build the case. When the clues yield few results, the cops hit the streets and start putting the boot into the criminal class. The homicide bureau is led by Lang-regular Otto Wernicke, who plays the recurring character Inspector Lohmann, a fearsome and corpulent scourge of shady practices and their practitioners. 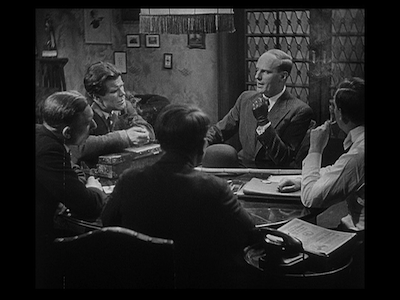 Lohmann's raids on speakeasies and other criminal hangouts begins to put a damper on the various illegal businesses, so the top crooks put their heads together and vow to capture the child killer themselves. The various criminal divisions are con men, pickpockets, and burglars, with the top of the food chain being a dangerous individual referred to only as "Safecracker." Actor Fritz Odemar strikes an imposing figure. He is easily the most stylish of the bad guys, swaggering in his leather trench, bowler, and cane. The crooks employ the Beggars Union as their street team. The theory is that panhandlers regularly go unnoticed. The case is cracked when a blind balloon salesman (Georg John) hears Beckert whistling Edvard Grieg's "In the Halls of the Mountain King" and recalls hearing a customer whistle the same melody on the day the last little girl was killed. The beggars spring into action, marking Beckert with a chalk "M" on his coat and following him street to street before cornering him after hours in an office building. The jig is up! Lang spends sufficient time with each aspect of the story, letting every character have his or her due, fully developing cop and criminal alike as their investigations run parallel to one another. What is perhaps most revolutionary and daring for the era, however, is how much screen time the director gives to the killer. While we are spared seeing any of the bloody details of Beckert's deeds, we are privy to his behavior after he satiates his bloodlust and how the compulsion next takes over him. Lorre is well known for his buggy eyes and reptilian voice. He is chubbier here than he would be for his more famous Hollywood roles in films like The Man Who Knew Too Much [review] and The Maltese Falcon [review], but he is already cultivating that sweaty, ghoulish manner that would see him play villains for most of his career. Hans Beckert is perhaps one of his most varied roles, as it features him jumping through many moods. At times, he is pitiful and almost sympathetic; at others, sinister. A scene of Beckert making faces at himself in a mirror is darkly comic and yet also unsettling. Lorre looks like he is legitimately losing his mind. 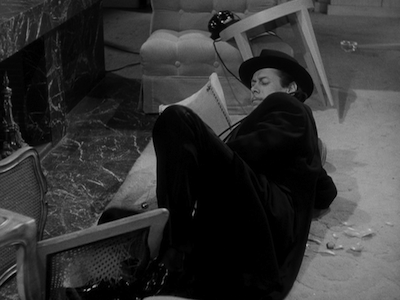 Fritz Lang's approach to the storytelling in M is perhaps best exemplified in how the criminals work through the office building, searching it floor by floor, room by room, until they find their man. (One sees a direct line from here to Rififi [review] and Le cercle rouge [review], in the nearly dialogue-free heist with robbers drilling through the ceiling, among other things.) This is how Lang and von Harbou also develop the script, considering every possible scenario, looking at the community impact the string of disappearances would have, how the fear and paranoia would turn neighbor against neighbor. As a director, Lang controls every aspect of his scenes and how he delivers the information to his audience. For instance, one of the major elements that the restoration efforts of the last decade have set out to correct are all the changes made to the soundtrack without Lang's blessing. 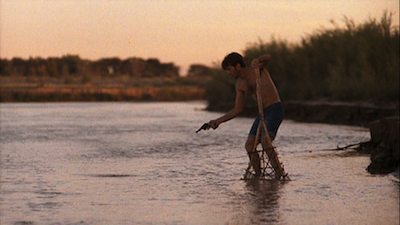 He chose to show many sequences without any audio at all, using silence to build anxiety and anticipation. When police raids descend on the streets, there is no dialogue, no ambient noise. It's dead quiet as swarms of men arrive in automobiles and begin corralling suspects. When the sound does return, the initial jolt is shocking. 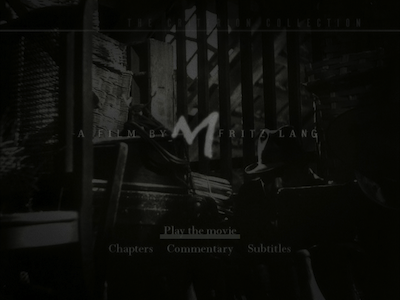 The Munich Film Archive print of M represents the film in its most complete form, quite possibly the edit that Lang originally intended. Though the running time is not much longer than the version Criterion released in 2004, it is substantially different in that the newly discovered nitrate has allowed the restoration team to fix jittery cuts and drop-outs and maintain a more consistent picture throughout. The film looks wonderful projected digitally. 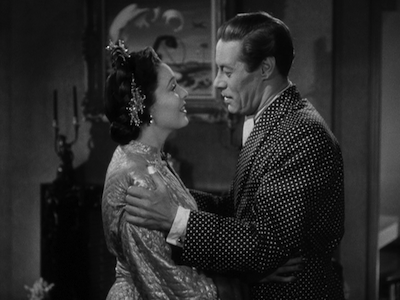 Lang's use of high and low angles, and his sense of how to frame an image, particularly his extreme close-ups, works even better when seen at a theatrical size. There are many engagements set up around the country, including the weeklong run at Portland's Cinema 21 that begins this Friday, March 29. Check the Kino site to see if M is coming to your area. It's well worth whatever effort it takes to see this in the cinema. M is an unforgettable film, melding a social consciousness with expert storytelling, balancing the macabre with realism for a queasy balance between the things that scare us and our desire to watch them come to life. 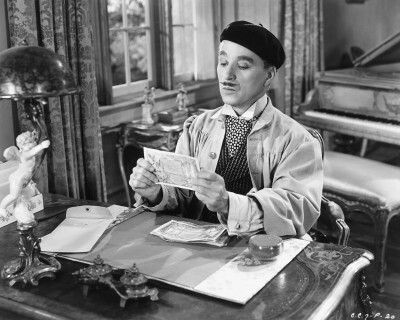 Writer/director/star Charles Chaplin moves on from his Little Tramp persona and embraces something entirely new in the darkly comic Monsieur Verdoux. Based on the story of a real-life "Bluebeard," and working from a script idea by Orson Welles (who originally was going to direct), the master filmmaker polished an odd little gem in this 1947 Oscar nominee. It's not exactly a gutbuster, but Monsieur Verdoux has a jaunty likability that works in concert and in opposition to its murderous intent, and proves as impressive and thought-provoking as Chaplin's previous effort, The Great Dictator [review]. 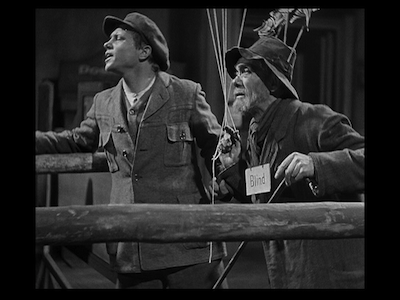 The titular Verdoux is a former banker who, in the early days of the Great Depression, found himself unemployed. In order to keep his paraplegic wife (Mady Correll) and their son (Allison Roddan) in their home and the life they are accustomed to, Verdoux has taken on a new career: that of a bigamist and gigolo. Adopting several different aliases, Verdoux fleeces multiple women in various French towns, juggling each like a traveling salesman visiting his different accounts. For instance, there is the loudmouth lottery winner Annabelle Bonheur (future denture-cream pitchwoman Martha Raye), who thinks Verdoux is a ship captain who only comes to port every six weeks. There is also the absent Ms Couvais, one of Verdoux's early victims. It's her large family that will doggedly pursue the crook, suspecting foul play. Never mind that the Couvais family is self-serving, bickering, and altogether disagreeable. Then again, you should mind, that's part of Chaplin's point. Monsieur Verdoux is an unconventional morality play. Its lack of any strict "crime does not pay" sloganeering rankled Hollywood censors, even as Chaplin worked in different story elements to placate them. Verdoux is a scoundrel and a villain, and yet, he has his reasons for the evil that he does. Chaplin plays him as a charming Don Juan with a heart of gold beating underneath his opportunistic veneer. The auteur stacks the deck in favor of those whom Verdoux cares for. His family has had bad breaks, and when the killer encounters a young woman down on her luck (played by Marilyn Nash), he empathizes with her misfortune and spares her a sinister experiment he has been planning. Conversely, the women that Verdoux bilks are genuinely distasteful. Bonheur is a loudmouth and a boor, while Marie Grosnay (Isobel Elsom), the rich older woman who rebuffs Verdoux's advances for the bulk of the film, is a real snob. Is Chaplin challenging our own perceptions by offering us victims whom we won't mind seeing meet their untimely end? I would say yes. For as with The Great Dictator and many of his earlier silents, Chaplin is as interested in reflecting on society's ills as he is in making his audience laugh. If Monsieur Verdoux is less popular than his previous endeavors, it may simply be that the latter concern takes a backseat in order to put a finer point on the commentary. As Verdoux's scheme runs its course, he doesn't so much defend all that he has done as implicate everyone else as accomplices. His argument is that, in a time when man's greed has allowed so many to go hungry, where everyone selfishly fights to preserve their own creature comforts without a care for their neighbors, no man is truly innocent. On the contrary, Verdoux himself is a necessary scapegoat. His crimes allow the rest of society to toss its collective guilt in his direction. It could have been heavy-handed, but the turn actually comes off as rather ingenious. 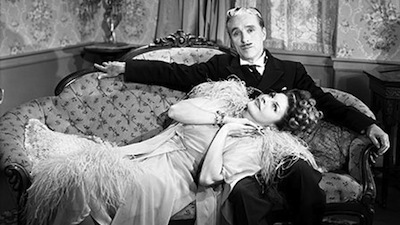 As proof of his argument, Chaplin gives us the girl whom Verdoux inadvertently assisted. His kindness allowed her a second chance, and she returns to his life to repay him when his own luck takes a downward turn. It's a simple but effective message: do unto others as you'd have them do unto you. While it may not have the same gory impact as the object lessons of a standard crime film, where a killer like Verdoux would be gunned down in the street, Verdoux throwing himself on the court of public opinion in the final act does basically serve as a kind of redemptive sacrifice. If the plot developments inspire any unease, it's born of the fact that he's essentially right, and you really don't have to be all that cynical to agree. The fact that this weighty material is crafted with such a lithe hand is a true testament to Chaplin's talents as a performer and a director. 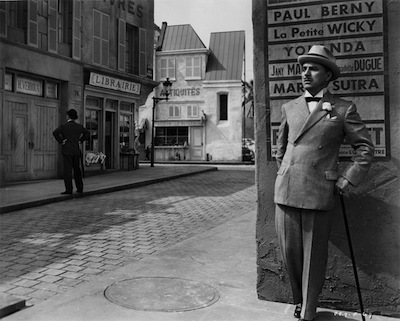 Monsieur Verdoux is his first genuine talkie, and he embraces that chattiness with full vigor. 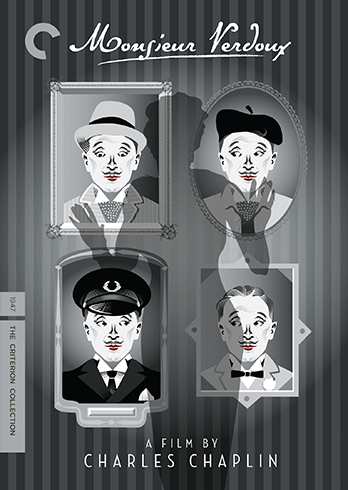 While there are still a few hysterical slapstick sequences--namely, his tumbling out a window when meeting Grosnay, or the shenanigans on the boat when he's trying to drown Bonheur--they are nowhere near the extended, balletic, dialogue-free material that made The Great Dictator such a joy. There are no long stretches where actors aren't speaking. Hell, there are barely short stretches. Chaplin doesn't need to be tripping over himself or mugging for the camera to command the screen, he is just as capable playing it straight. Though, I was amused by the fact that, from time to time, you can catch him looking toward the audience as if to double-check if we're still in on the joke. By the way, this might make a great double-feature with Unfaithfully Yours. Preston Sturges' 1948 release, Unfaithfully Yours, is probably his darkest comedy, but it also has a heart of pure romance. 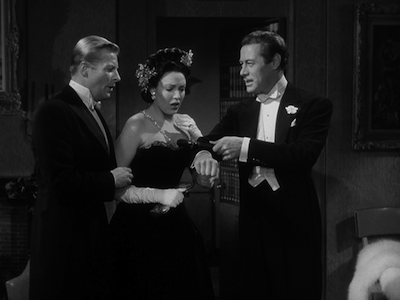 Rex Harrison (My Fair Lady [review]) stars as Sir Alfred, a temperamental orchestra conductor who, upon returning from a trip overseas, is informed by his obnoxious brother-in-law (Rudy Vallee) that he has evidence that Sir Alfred's wife, Daphne (Linda Darnell, Fallen Angel ), might be cheating on him. It seems that, as he was saying good-bye, Alfred made an off-hand comment to the other man to keep an eye on his wife for him. The other man took him literally and hired a private detective (Edgar Kennedy) to follow Daphne around when he couldn't do it himself. Upon first hearing the news, Alfred rejects it, insisting it's impossible and not even bothering to look at the report. Once the knowledge is out there, though, it keeps coming back up, and the harder Alfred fights to not know, the more the information works its way to him. The scandal hinges on an unexplained half hour when Daphne visited Alfred's assistant, Tony (Kurt Kreuger), dressed in her nightgown. Is it possible that an illicit love affair has been blossoming right under the music man's nose the whole time? 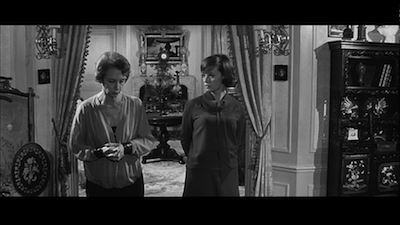 Unfaithfully Yours is, essentially, a comedy about jealousy, with Sturges using the tricks played by one man's mind to explore the notions of fantasy and revenge and the stupid spirals we can send ourselves into when possessed of an idea we can't shake. As Alfred conducts that evening's performance, with his wife and secretary, not to mention the brother-in-law and his smart-mouthed sister-in-law (Barbara Lawrence, whose caustic delivery dominates every scene she's in), watching from boxed seats, he imagines a trio of scenarios. Sturges and director of photography Victor Milner (It's a Wonderful Life [review], The Furies [review]) push into the man's mind, zooming in on his eyeball, dissolving into his daydreams. First is an elaborate scenario where he frames Tony for Daphne's murder, and then another where he takes the high road and capitulates, and finally, a third where he challenges his rival to a game of Russian Roulette. Here even Alfred's fantasy life turns against him, in that he does not succeed. While we entered his musings via the eye, we exit in macabre fashion, peering back into the real world through the bullet wound. It's a gruesome and ingenious cross-fade. 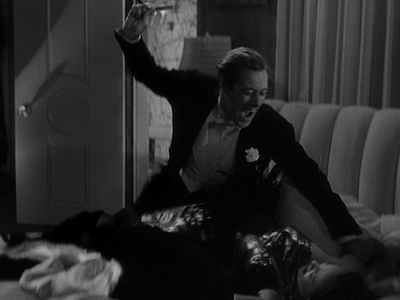 Rex Harrison is gung-ho, giving a dastardly, high-octane comic performance as the moody, self-involved artiste. 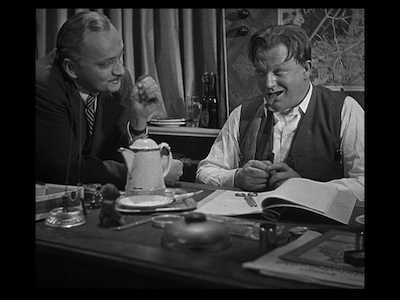 He is biting and sharp with Sturges' verbiage, but also quite agile and adept playing the klutz. When the movie shifts to Alfred trying to make these dreams real, Sturges builds an extended slapstick sequence where Alfred's every move ends in some kind of bumbling disaster. The implication is bitterly ironic: Alfred is helpless to do anything himself, but the man he wants to frame for murder is the one who usually does everything for him. It's a clever commentary on the life of an “artistic genius,” and the culmination of a secondary theme that runs throughout Unfaithfully Yours. Arguably, the reignited passion Alfred feels as a result of his marital doubts goads him into the performance of a lifetime. As the three different daydreams play out, the music that Alfred is conducting keeps going. It rises in emotion and intensity as the imagined scenes do, and by the time we wend our way back to the symphony hall, Alfred has whipped the players--and his audience--into a frenzy of sound and excitement. It's one of the best examples I can think of where a director uses the soundtrack for both text and subtext. 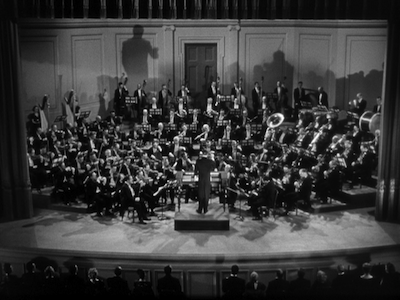 Unlike a standard score, which is usually there to underline and augment, Sturges uses the classical music as a practical device, making it an integral mood enhancement for his protagonist. Life, love, and art are all intertwined. Unfaithfully Yours, unsurprisingly, ends the way most screwball comedies and romantic misadventures do. Alfred is, after all, a buffoon, not a real killer, and had he been right or successful, this would be an entirely different motion picture. The great thing about Preston Sturges is that he pulls no punches. The writer/director/producer hits the lovey-dovey stuff hard in the end, but he makes it work. He has basically added a second crescendo to the first (Alfred finally confronting Daphne), rather than a romantic coda or denouement. The climax is not the fury and the resolution is not its deflation, but rather, the true peak, and the perfect note to chime out on, is the reaffirmation that, indeed, love has come true for these two, and nothing can tear them apart. Revisiting Jean Renoir’s 1946 version of Diary of a Chambermaid compelled me to dust of Luis Buñuel’s 1964 remake, as well. 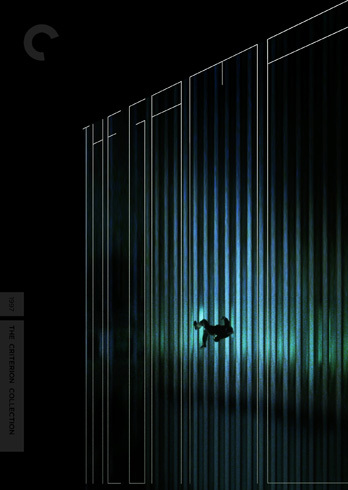 As I noted in my review of the former, I have an irresistible urge to put the two of them together, much like Criterion did with the Renoir and Kurosawa versions of The Lower Depths. Apparently there is a new adaptation in the works starring Marion Cotillard, as well, and time will only tell if I’m going to end up having a triptych. Cotillard is certainly a worthy successor to the great Jeanne Moreau as Celestine. Moreau played the lead with a strength and dignity absent from Paulette Goddard’s original interpretation. Goddard mistook loudness for being assertive, which might have been a good choice had the film been portraying the chambermaid as a rube who didn’t know her place rather than the city girl all the country peasants admire and lust after. Moreau understands the complexity of Celestine’s position, of the discrepancy between the woman’s self-worth and the dictates of her class. Hers is a far trickier method of navigation, catering to her boss’ and giving them what is required, but also withholding a little of herself for her herself. The Buñuel Diary of a Chambermaid updates the setting of Octave Mirbeau’s turn-of-the-century novel, placing it in France post-World War I, amidst racial turmoil and the nascent fascist movement. Celestine has left Paris to join a wealthy country house, primarily to cater to the elder head of the estate, Monsieur Rabour (Jean Ozenne). She quickly finds that all is not as it seems. Money here does not equal culture, but the pretense of such. Rabour’s daughter, Madame Monteil (Francoise Lugagne), is stingy and demanding, while her husband (Michel Piccoli, Belle de jour [review]) is distracted and horny. As the neighboring maid, Rose (Gilbert Géniat), warns Celestine, the madame will fire you and the monsieur will leave you pregnant. Given the political climate throughout Europe in the 1930s, and the existing class conflict in the narrative, Buñuel could have created an either/or scenario here, with the working class painted as the heroes poised for a revolution. The groundskeeper for the estate actually speaks of one, and he seems to see a new day for men like himself, but the Joseph in this version, played as a brute and a rapscallion by Georges Géret (Z [review]), is never mistaken for a hero. His revolution is a nationalist one. 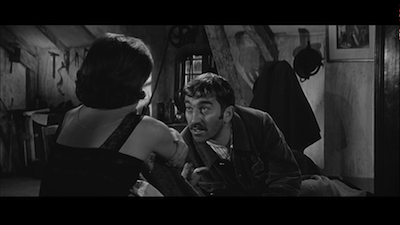 He is a racist and an anti-Semite who wants to take France back “for the French.” Buñuel shows Joseph for everything he is, and bitterly so. He is an elusive figure, escaping his deserved fate. When a local girl is raped and murdered in the woods, Celestine is convinced Joseph had something to do with it, but she can’t prove it. She can’t even frame him for the crime. Unless I missed it, Diary of a Chambermaid ends without ever really telling us who the killer is. There is at least one other suspect, and for a time, Buñuel lets us believe he’s the one, only to surprise us by revealing whom we thought to be the next victim is still alive. The true identity of the murderer doesn’t really matter, though. The death of this innocent is meant as a symbol. Her killing is representative of the dark cloud that was on its way, one that Buñuel was caught under and persecuted by in his youth. 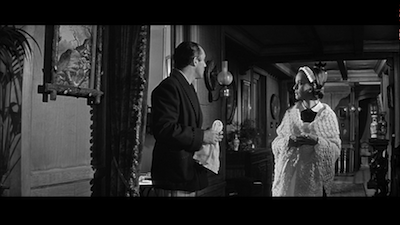 Though she is killed off screen, we know exactly what happened to her by how Buñuel and director of photography Roger Fellous frame her body when her death is revealed. It’s a foreboding image, alluring and repellent at once, as the girl is returned to nature and nearly blends in with her surroundings, the snails she was out hunting for supper crawling over her lifeless skin. Thus, Joseph heads off to be divisive, denied the love of Celestine, who then, by some irony, becomes a unifying force, ending the feud between Monsieur Monteil and his neighbor, the old soldier Captaine Mauger (Daniel Ivernel), by marrying the elder man. Now the neighbors are friends, and Mauger even reverses his positions, blaming his past consternation on the attitude of Madame Monteil and declaring her husband, the man he once called a “dirty jew,” to be a righteous dude. Slyly, Buñuel adds another layer of irony. Our last image of Celestine is of her in bed, eating breakfast, and ordering Mauger to take away her food. She has become the Madame. At the same time, she has already grown bored. It’s the second time we’ve seen her as such. Prior to that, at what is pretty much the dead center of the film, we witness what I would call Diary of a Chambermaid’s pivotal moment: a yawn. While old Rabour fusses with her boot and waxes poetic about how he will polish it, Celestine is barely able to stifle her disinterest. This is Jeanne Moreau’s masterstroke. She shows that Celestine is above all of these petty things, above the jealousies and the base desires and even the seemingly silly politics. She belongs elsewhere, she’s not just not sure where. That restlessness creeps back in at the end. She realizes that Mauger’s home is not her own, and as it’s immediately juxtaposed with Joseph and a fascist march, we can extrapolate that France is no longer her home either. I've always considered Badlands, the 1973 debut of writer/director/producer Terrence Malick, to be a little outside the rest of his oeuvre. In my head, it was easily the most conventional of his pictures, as it has the closest thing to a structured plot, essentially being a fugitive road movie at its very base. I imagined that for his debut, to earn his reputation, Malick had one foot in the studio system and one foot in the territory he would soon stake out as his own, getting the powers that be on board before completely leaping over to the other side. Having now watched Badlands for what I think is at least the fourth time, I am left scratching my head as to why I ever had such an opinion. Perhaps it's seeing it in a new context. Last time I watched the film, it was a faded 35mm print, laden with scratches, and played over a speaker system that made the movie sound like it was being projected from inside a bank vault. So, seeing it in a new, high-definition format is extremely illuminating. Not just like someone opened the vault doors, but they knocked down all four walls and took off the ceiling. There may be no second first impressions in life, but I do feel it's possible to see a movie, to really see it, for the first time even when you've watched it before. 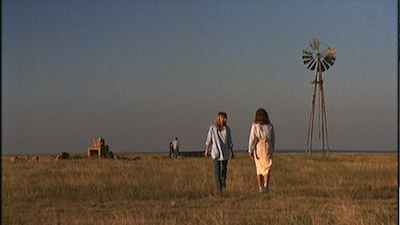 Because looking at Badlands now, I see the beginning of everything Terence Malick. The classical music, the respect for nature, the poetic longing, disconnected voiceover running parallel and often perpendicular to the montage. 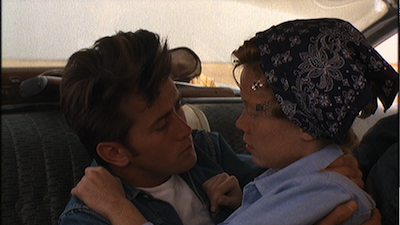 Badlands has the same dreamy atmosphere, the same languid narrative pace, ebbing and flowing more to the vagaries and impulses of its characters and their circumstances than it is beholden to screenwriting structure. What one might argue, rather than carving Badlands away from the greater whole, is that this is the adolescent stage of the Malick filmography. There are certain growing pains, a not fully formed sense of identity, and a restlessness, all of which meshes perfectly with what is actually happening on the screen. Badlands is, in many ways, a modern-day Romeo and Juliet [review], but filtered through the angst and existentialism of mid-20th Century Americana. Its story of lovers on the run is loosely based on the real-life story of Charles Starkweather and his teenage girlfriend. In the 1950s, the pair went on a killing spree, and though the real-life story was far more grisly and far from romantic, Starkweather had a kind of doomed matinee-idol image that earned him comparisons to James Dean. As Martin Sheen says in the new documentary on this disc, there was something compelling and complex about this bad man, and something unsettling about how charismatic he was. Sheen was aware of the original story when he took on the role of Kit, the Badlands analogue to Charles Starkweather, and as a performer, he embraces both the obliqueness and the self-satisfaction of a disturbed individual raging against the world. Though the fury is mostly implosive like Dean's in Rebel Without a Cause (except when, you know, it does explode), the motto of this wayward soul should perhaps be more in line with Brando in The Wild One [review]. What was he rebelling against? Whatever you've got. Happenstance plays a big part in the Badlands story. Who falls under Kit's gun is all a matter of who walks in front of it. 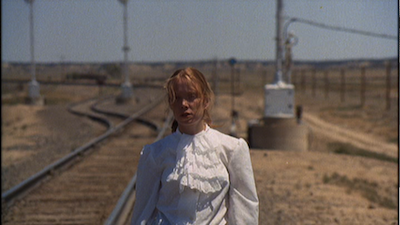 The same goes for how he meets Holly (Sissy Spacek), a girl ten years his junior. He skips out on his job as a garbage man early, and he sees her practicing her baton in her front yard. For the inexperienced girl, it resonates as fate, the far-more teenaged impulse, all but making their doom inevitable. Her father (Warren Oates) doesn't approve, and his assertion of parental authority is what sets events into motion. Kit kills him first, and then takes Holly on the run. For the next couple of weeks, they move from place to place, taking what they need, and Kit leaves a trail of bodies behind. Though Badlands is essentially a story of young adults losing their way just as they are starting to find it, there are also interesting comparisons to be made to stories about even younger children. Kit and Holly are on a kind of warped version of adventures where kids are stranded away from civilization. They first stop in the woods and build a treehouse and live off the land, creating their own society somewhere between Swiss Family Robinson and Lord of the Flies. They also made me think of the two runaways in Wes Anderson's Moonrise Kingdom [review], particularly in how both the boy and the girl in each scenario represent different temperaments. 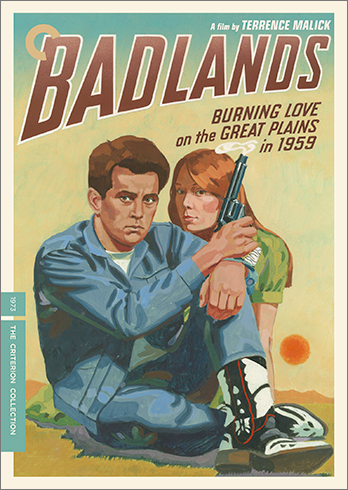 Whereas Anderson's film is more romantic, and the differences between Sam and Suzy end up providing them solace, in Badlands, the grown-up lesson is in how two people initially seduced by the mysterious otherness of their companion can and do grow further apart. By the end of their flight from justice, Holly is bored and Kit's determined philosophizing has ceased to interest her. In truth, he is all action, all kinetic energy, and he only survives while in motion. She's the thoughtful one, as evinced by her narration, and so purposeless action holds no extended appeal. It's been forty years since Badlands was originally released, though even when it was new, the movie cast its gaze back nearly twenty years, re-creating a period of American life that is often clouded by nostalgia. Malick's vision is more timeless, however, and throughout his career, as he moves his stories up and down the chart of modern history, he is more interested in the constants than he is any perceived change. Man is and has always been a product of the natural world, and the only thing more persistent than nature herself is the human propensity for violence and cruelty. Our hubris flows from our need to dominate, which leads only to death; the more we embrace our place within all that surrounds us, as we saw the characters do in The Tree of Life [review], the better off we are. Punishment comes to those who disrupt the chain--Holly's father killing her dog, for instance, unleashes some bad karma; or, Kit and Holly being the most content when playing house in the wilderness, encased in the life-giving foliage, and the further they rush out into the open, the more insignificant they become. 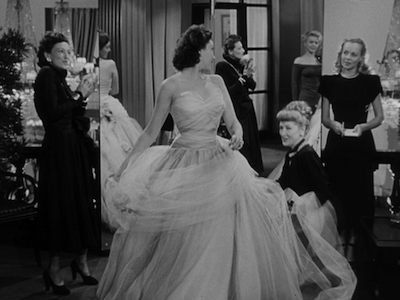 The film ends with an interesting coda that shows Kit about to become a kind of celebrity. His life as an outlaw is attractive to those who have never indulged their dark impulses. The rebellious American spirit he embodies would have us believe he was more free when on the run than the rest of us are when staying put. Yet we also see that he is a con man, that he will try to lie and charm his way out of trouble, even as he embraces being a tragic antihero on a collision course with the gallows. It's further proof that he will never change, whereas Holly can and has. Our last view of her is of a young woman smirking at the antics of a man she will likely always hold some affection for, but whose tricks she now sees right through, even as everyone else continues to be fooled.